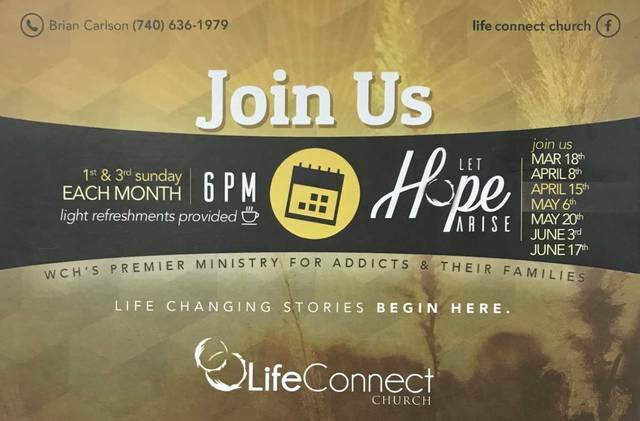 The next addiction recovery support meeting is scheduled for Sunday, April 8 at 6 p.m.
LifeConnect Church is located at 232 N. North St., Washington C.H. This week marked the first meeting of a new faith-based addiction recovery support group at LifeConnect Church in Washington Court House. Sixteen people were in attendance for the first meeting Sunday, with some participants from the community still in active drug use and others who were admittedly celebrating sobriety. Wolfe facilitates the meetings, and Brian Carlson, the church’s director, spearheads organizing the ministry’s recovery meeting. Meetings are held twice a month. Each meeting will have a featured speaker who is either actively in addiction, has overcome an addiction, or has a family member who experienced addiction. A faith-based devotional chosen for each meeting goes along with the active speakers. The meetings are scheduled to last no more than an hour, said Wolfe, and will provide attendees with an opportunity to connect with prevention and treatment resources and one-on-one counseling. “We want everybody from every aspect of this epidemic to have a voice and have an opportunity to get help and overcome it,” said Wolfe. Wolfe said the church’s recovery meeting is not intended to replace any other tools, meetings or methods of overcoming addiction. “I believe everything in life is spiritual. Bad things happen to good people but our reaction to them is the spiritual aspect. What we do with that situation is the spiritual part. Most of the folks who are in addiction are because they are trying to fill a void or cover pain from an event in their life. Rather than spending their life in addiction, we want to show them God loves them and has a bigger purpose for their life. We just want to show them that there is hope and there is light at the end of the tunnel,” said Wolfe. LifeConnect Church is located at 232 N. North St. in Washington C.H.